As I've mentioned before, I really enjoy designing bases just to see how other players will react. I've come up with a decent BH4 design that I think I'll stick with a while. This is a take on the basic donut ring style base used on the main game. The entire outer perimeter is junk buildings and will keep the typical ground troop pretty busy while getting pummeled by the defensive ring. 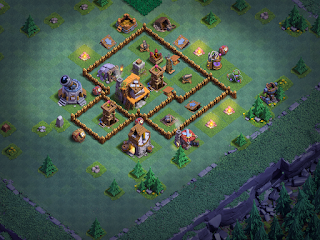 Attacks from the top will typically be Archers looking to take out that Crusher so giants can break in for the win. A Push Trap and a couple of Mines will deal them enough damage to slow such an attack down, especially if the attacker is in the early to mid stages of BH4. Coming in from the sides or bottom will mean going through junk buildings and taking heat from the attack ring. Barbarians don't stand a chance against this base at all; Archers can snipe the outside ring but evaporate as soon as they are in range of the defense ring. Air troops can do the same before they face a heavy defense from Firecrackers, Air Bombs, and the Archer Towers. Giants will break through but also receive concentrated fire that quickly depletes their ranks as they simply walk around in a circle. As soon as I get the walls upgraded, giants won't even be a factor. 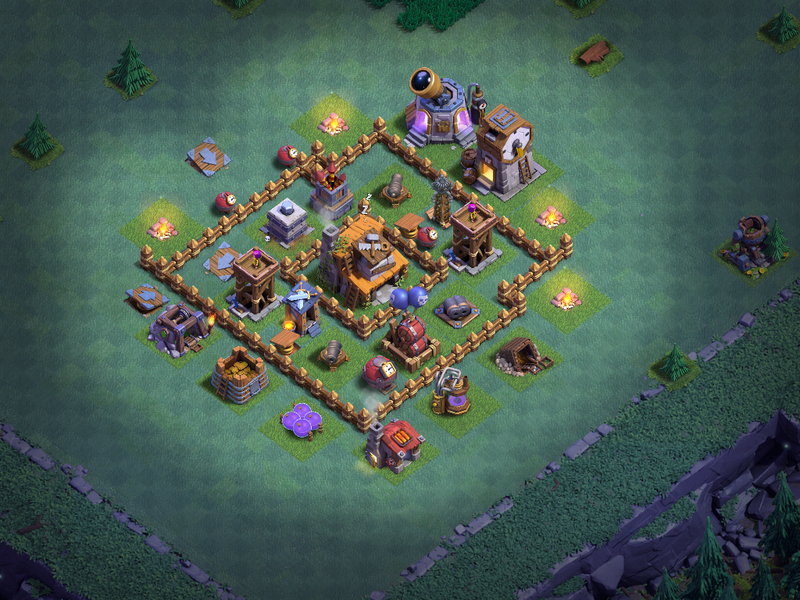 Strong attackers with max level troops can get up to 80%, two stars on this base right now using a ground attack (again - need to get the walls upgraded). Even there, though, they need to be good attackers; that does not describe the vast majority of players in this game. Normal players get between 30%-60%, one-star (if any). I continue to tweak trap placement, but this will become my current go-to base design for BH4 as it seems to be performing very well at the present. 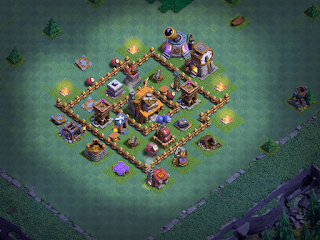 This base was developed organically from a BH3 rendition I use. It has multiple compartments (which slows ground troops down), junk buildings around the outside to both slow troops and allow defenses inside to pummel them, and strong protection for the BH when attacks come from the right. Its weak point is from the left but that's only for decent attackers. 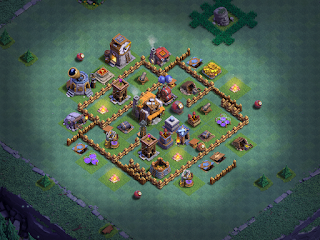 Most players see this base and come from the right or bottom; those who come from the left tend to blast their troops all at once and fall victim to the Megamine.